Interior decorating can be overwhelming. 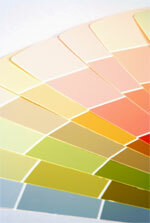 So too can be choosing a color; are you overwhelmed at the thought of picking out a color palette for your house? If you are unsure whether a group of colors go well together, you may want to choose a traditional decorating color schemes. Just remember to choose one color as your main color and then use your other colors as accents to avoid making the room too busy. One of the most popular color schemes today is the seaside scheme. A sandy tan, a fresh aqua blue, sea glass green, and pale peach are all colors in this scheme. Pale gray shades that evoke the feel of weathered boardwalks will also blend well with these colors. A more tropical color scheme includes olive greens, sky blue, and warm brown toned colors. Red and purple also can be used with this color scheme, as they bring tropical flowers to mind. For a more airy feel, you may want to consider a crisp white color, as well. For a European color scheme, you will want to use rich old world colors, such as dark gold, blue, purple, black, and a deep red. These colors should have a bit of a glow to them. Do you prefer a trendy French color scheme? China blue, pale gold, and light maroon colors are ideal for evoking a French country mood. If none of these color schemes is right for you, perhaps you'd prefer an Asian decorating theme. Simple black and white colors with Chinese red and blue accent colors are most common for this theme. A bit of gold can also be used with this scheme. Once you select your color scheme, you are well on your way to creating the home of your dreams.